With Garaga, the possibilities are endless! 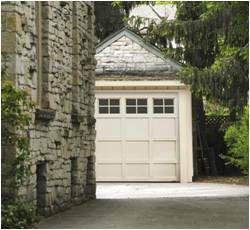 Your garage door is a major investment that also influences the appearance of your home. 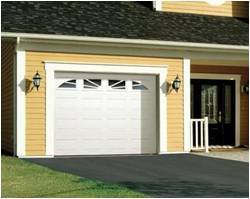 Garaga is the recommended brand because they offer a vast selection of styles and colors along with various choices of insulation and door size. With all these options, finding the perfect door among their wide range of products is easy. You can be assisted by Garaga in assuring that your house will be complemented by the door you choose. You want for your door to look like it was designed by the same craftsman who designed your home. 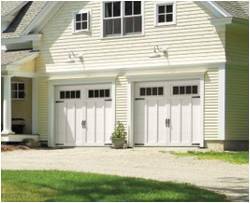 Carriage house: The EastmanTM door is the perfect blend of traditional elements with the latest trends. You will be attracted by its elegant woodgrain finish, hardware reminiscent of wrought iron, and appealing choices of decorative windows. Traditional: you are sure to be charmed by the Cambridge’s authentic architectural elements and classic styling. It is built with precision and attention to detail resulting in its unequalled appearance. Country-style: the Stratton 138 and the North Hatley are excellent choices for a country-style home. These two traditional door designs are also very eye-catching, and come in many colors and window styles. 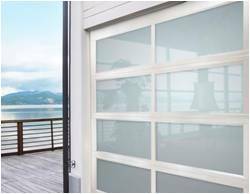 Classic: the distinctive look of your home will be enhanced by the attractive details available with the Standard+ and the Acadia 138. These doors are a wise choice due to their affordable price and minimal maintenance. Modern: the California is in a class of its own. Its windowed panels and fresh new look make it favored by many owners of modern homes. Want to be inspired? Then view some of our projects in our Image Gallery or visit our virtual Design Centre where a photo of your home can be uploaded and the garage door interchanged. Various combinations can be tried out to see what different types of doors look like on your house! You can be aided by our specialists in selecting the appropriate level of insulation based on your garage’s planned usage. 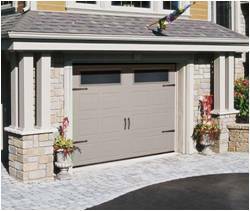 If your garage is attached to your house or if you plan to use it as a workshop or recreation area, an insulated garage door is strongly recommended. 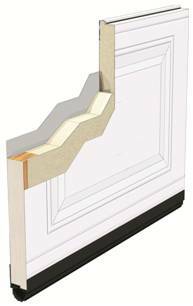 R‑16: this is the highest level of insulation offered by Garaga for its residential doors. This type of insulation is highly recommended for garages attached to your house, assuring that your garage, as well as your home, stay warm in the winter and cool in the summer. 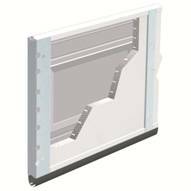 R‑12: this door has high-pressure-injected polyurethane foam and Interlok™ triple-contact interlocking joints yielding a level of insulation recommended for garages attached to houses or located under rooms of the house. Your workshop will be kept at a comfortable temperature by the R-12 level of insulation, allowing you to work in your garage throughout the year. R-6.6: this galvanized steel garage door is insulated with a layer of styrene. It is suggested for a shed or detached garage where light insulation protection is required. 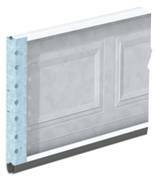 Non-insulated: this option consists of a 24‑gauge galvanized steel door containing no insulation. It is recommended for sheds or garages not attached to your house and not used as a workshop. Get a free estimate. The team at Gutwein Quality Doors, Inc in Fairbury would be happy to be involved in your project!